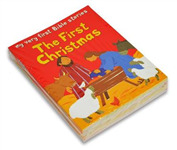 The Bible story of the Easter festival, charmingly retold and illustrated for 5-7s. A favourite story from My Very First Bible for shared reading. A bright anthology of stories, poems, prayers and crafts linked to Easter. A perfect introduction to ever-popular outdoor sports.